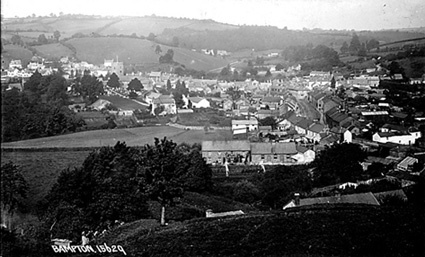 This photograph is of Bampton in Devonshire taken early in the 1900's I think. This is the place where my grandfather, Lara William Besley, was born and bred. For other photos of old and new Bampton click on the link here or on side of page. Lara William was the third son of Samuel Besley and Eleanor Escott. The oldest son, Samuel Dixon came out to NZ to settle and Lara William also. Samuel set up as a baker in Buffin St. Christchurch and Lara worked at a number of jobs around the area of Little River before marrying Mary Bertha Harris and after that establishing the bakery at New Brighton. 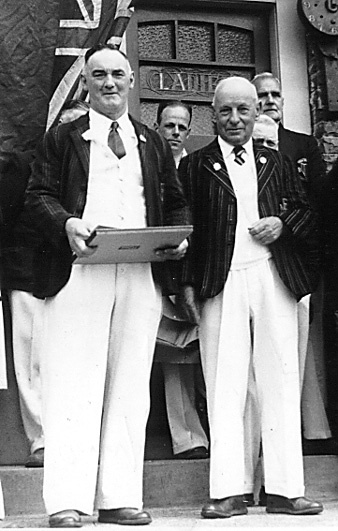 Ponty, as he was known in the family and locally, was a keen bowler and did well at the sport - not only in New Brighton, but when back in England on a visit to his homeland. Lara, on the right, at a bowling presentation. He is on the left in the farming scene. Barbara Besley of Calverleigh died 1697 - probate. m. 9 Apr 1807 m.
Probate: Thomas Besley yeoman of Loxbear 3 Dec 1795. THOMAS BESLEY 1781: 1807 - bachelor of Loxbear marries by lic. Witness Mary Besley. Wife ANN TURNER: 1807 - of Buckland St Mary. Witness John Turner. m. 16 Mar 1820 m. 21 Jan 1829 m. 30 Jul 1829 m.
I m. 8 Dec 4Q 1889 m.
I I I I I I ? I ? ? ? AMELIA BESLEY 1839: 1841 - 2 yrs, with parents. 1851 - 12 yrs, living with widowed mother and siblings. 1861 - Amelia "Smale", living with older sister Emily who had recently given birth to baby in Clerkenwell. 1871 - 27 yrs, assistant on family farm in Calverleigh with widowed mother and 2 other unmarried siblings. 1881 - Amelia, 38 yrs, dwelling Quirkhill Farm with husband James and her sister, Elizabeth Bennett, who is listed as an assistant. 1891 - Amelia, 49 yrs, dwelling Quirkhill Farm with husband James and her sister, Elizabeth Bennett, who is listed as an assistant. 1901 - 60 yrs. Husband JAMES BESLEY: 1881 - 36 farmer (100 acres employing 2 servants), with wife and sister-in-law. 1891 - 47 farmer employing 1 servants, with wife and sister-in-law. 1901 - 55 yrs, farmer, dwelling Harpridge, Washfield with wife and servant Rebecca Greenslde aged 64 yrs. ANN BESLEY abt 1823/4: 1854 - single, literate, witness to marriage sister Emily and Thomas Beedell - both witnesses signed. Husband WILLIAM GALE bahelor, yeoman of Washfield, son of John - also a yeoman. ANN BESLEY abt 1826: 1841 - 15 yrs, with parents. 1851 - 25 yrs, living with widowed mother and siblings. 1861 - ? CHARLES BESLEY 1869: 1871 - 1 year, with family. 1881 - 11 yrs, scholar, living in Bedminster, Somerset with widowed mother and older sister. 1891 - 21 yrs, blacksmith, living with brother Ernest and his wife in St Marylebone. 1901 - 31 yrs, blacksmith, living with brother Ernest and his family in Paddington. CHARLES ERNEST BESLEY 1891: 1901 - 9 yrs, with parents. 1911 - 19 yrs, assistant draper, living with parents. ELIZABETH BESLEY 1805: Married by licence, both signed, witnesses James Besley and Charity Beedell. Husband GEORGE MAUNDER: Yeoman of Templeton at time of marriage. ELIZABETH BENNETT BESLEY 1831: 1841 - 9 yrs, with parents. 1851 - 18 yrs, living with widowed mother and siblings. 1861 - 25 yrs, living with mother and brother. 1871 - 35 yrs, assistant, living with mother, sister and brother. 1881 - 48 yrs, spinster, living with sister Amelia and her husband at Quirkhill Farm as an assistant. 1891 - 57 yrs, assistant on Quirkhill Farm, living with sister and brother-in-law. Died aged 64 yrs. ELIZABETH BESLEY 1857: 1861 - 3 yrs, with parents. 1871 - 13 years, with family. 1881 - 23 yrs, milliner, living in Bedminster, Somerset with widowed mother and younger brother. ELLEN BESLEY 1863: 1871 - 8 years, with family. 1881 - 21 yrs, milliner. ELLEN BESLEY 1891: 1911 - 6 yrs, living with parents. ELSIE KATE BESLEY 1897: 1901 - 3 yrs, with parents. 1911 - 13 yrs, living with parents. Died aged 14 yrs. EMILY BESLEY abt 1829: 1841 - 12 yrs, with parents. 1851 - 20 yrs, living with widowed mother and siblings. 1861 - 31 yrs, married and living 30 Chapel St Clerkenwell with young 3 moth old daughter Mary B. Sister Amelia also in residence but her surname spelt as Smale instead of Besley. Husband STEPHEN SMALE abt 1826: 1861 - 35 yrs, master baker. EMMA BEEDELL BESLEY abt 1826: 1841 - 15 yrs, with parents. 1848 marriage - spinster daughter of Henry of Calverleigh, signed, witness James Beedell. 1851 - married with 1 yr old daughter, dwelling Washfield with husband William Hatswell. Died Mile End Old Town, London. Husband WILLIAM HATSWELL abt 1813: 1848 marriage son of William - signed. 1851 - 38 yrs, farmer of 15 acres, dwelling Little Headon, Washfield with wife and young daughter. Died between 1868 and 1871. ERNEST SAMUEL BESLEY 1859: 1861 - 1 yr, with parents. 1871 - 11 years, with family. 1881 - 21 yrs, joiner, boarding with Pine family Redcliff Street, Cheddar, Somerset. 1891 - 31 yrs, carpenter, dwelling 16 Sherborne St, St. Marylebone, with wife and unmarried younger brother, Charles. 1901 - 31 yrs, carpenter, dwelling 57 Walterton St,. Paddington with wife, 4 children and unmarried younger brother, Charles. 1911 - 51 yrs, carpenter and joiner, dwelling 57 Walterton St,. Paddington (3 rooms) with wife of 22 yrs, 5 children (of the 10 remaining alive) and a visitor. Died aged 57 yrs. Wife ADA ROBINSON TAYLOR abt 1865: 1891 - 24 yrs. 1901 - 36 yrs. 1911 - 45 yrs. Died aged 90 yrs. GRACE BESLEY 1748: Married by licence. Of Tiverton at the time. Everyone present signed their names. Henry Bidgood of Calverleigh. Witness Henry Besley. GRACE ANNE BESLEY 1835: Died aged 2 yrs. GWLADYS MARY BESLEY 1892: 1901 - 8 yrs, with parents. Admitted to Moberly School aged 9 yrs. 1911 - 18 yrs, domestic nurse, living with parents. HENRY BESLEY abt 1749: Wife Elizabeth baptised same time as son Thomas. HENRY BESLEY abt 1793: Married by banns, bachelor, both signed, witnesses James Beedall and ? Besley. 1829, 1834 & 1836 yeoman, residing Hill Farm, Calverleigh. 1839 yeoman residing Calverleigh. 1841 - 45 yrs, yeoman, dwelling Hill Farm Calverleigh with wife and 6 children. (4 male & 1 female servant). Estate duties Office Will - 1842 - Henry Besley of Calverleigh. Wife MARY BEEDALL abt 1798: ? Daughter of William 1759 - 1832 and Charity Dark 1760 - 1830. 1841 - 45 yrs. 1851 - 53 yrs, widow, dwelling New Inn, Calverleigh with 5 children. 1861 - 63 yrs, farmer 40 acres, dwelling New Inn Farm, Calverleigh with 2 grown up kids. 1871 - 73 yrs, widowed farmer of 40 acres (employing 2 boys), dwelling New Inn Farm, Calverleigh, with grown up son and 2 daughters. Died aged 78 yrs, of New Inn. Calverleigh. HENRY BESLEY 1838: 1841 - 2 yrs, with parents. 1851 - 12 yrs, with parents. JAMES BESLEY 1807: 1841 - 30 yrs, agricultural labourer, dwelling Esworthy, Templeton with wife and young son. 1851 - 43 yrs, agricultural labourer, dwelling Esworthy Farm with wife and 12 yr old son Henry. Wife ANN abt 1804: 1841 - 35 yrs. 1851 - 47 yrs. Died aged 48 yrs. JOAN BESLEY 1758: Married by licence. Both signed as did witnesses Thomas and Henry Besley. JOHN BESLEY 1767: 1798 Templeton Land Tax - 1 allotment belonging to Charles Chichester Esq - John Besley proprietor - £3- 17s and 1 allotment belonging to Joseph ....agle Esq - John Besley proprietor - £3- 15s 8d. Died aged 52 yrs, of Rackenford. Will proved in 1818. Estate duties Office Will - 1818 - John Besley of Templeton. Wife ELIZABETH (BETTY) BENNETT: Died aged 59 yrs, of Cruwys Morchard. Will proved 1827. Estate duties Office Will - 1827 - Elizabeth Besley of Templeton. JOHN BESLEY 1798: Died aged 17 yrs, of Rackenford. JOHN BESLEY abt 1836: 1841 - 5 yrs, with parents. 1851 - 15 yrs, living with widowed mother and siblings. 1861 - 21 yrs, with widowed mother and older sister on the farm. 1871 - 32 yrs, farmers son, with widowed mother and older and younger sisters. 1881 - 45 yrs, farmer of 40 acres, dwelling New Farm Inn with wife and one servant (relation of wife!) 1891 - 55 yrs, farmer New Inn Farm, Loxbeare, with wife and Agric. lab Wm Chubb 50 yrs. 1901 - 65 yrs, farmer New Inn Farm, Calverleigh, with wife. 1911 - 75 yrs, farmer, dwelling Broadclose, Rackenford, (near Morchard Bishop) with wife of 30 years in a 6 roomed dwelling with a boarder. Died aged 79 yrs. Wife JANE M CHUBB abt 1839: 1881 - 43 yrs. 1891 - 52 yrs. 1901 - 60 yrs. 1911 - 73 yrs. Died aged 80 yrs. MARK BESLEY 1843: Died aged 3 days, of South Combe. MARY BESLEY 1747: Henry Besley witness to marriage. By lic. All parties signed their names. MARY BESLEY 1799: Died aged 30 yrs, of Cruwys Morchard. MARY BESLEY 1834: Died aged 1 yr 9 mths. MARY CAROLINE BESLEY 1867: 1871 - 3 years, with family. 1881 - ? NATHANIEL BESLEY 1812: Died aged 16 yrs, of Templeton. NATHANIEL BESLEY 1829: 1841 - 12 yrs, with own family in Chilcott household. 1851 - 21 yrs, plumber and glazier, unmarried lodger with Henry Lewis, dwelling 12 Durham St., Chelsea, MDX. 1861 - 31 years, journeyman housepainter, dwelling 12 Magdalene Rd, Exeter St Sidwell with wife and two children. (Down the road at no. 17 is a 70 yr old widowed Mary Besley lodging - could this be Nathaniel's mother?). 1871 - 41 yrs, housepainter, dwelling 12 Magdalene Rd, Exeter St ASidwell, with wife and 5 children. Probate: 1 Jul 1880. Effects under £300. Administration of the personal Estate of Nathaniel Besley, late of 12 Magdalen Rd. in the county and city of Exeter, painter and glazier, who died 7 Jun 1880 at 12 Magdalen Rd., was granted at Exeter to Mary Ellen Besley of 12 Magdalen Rd., Widow, the relict. Wife MARY (H)ELLEN DOWDEN abt 1829: 1861 - 32 yrs. 1871 - 42 yrs. 1881 - 51 yrs, publican, living in Maltsters Arms, 10 Phillip Street, Bedminster, Somerset with adult daughter Elizabeth and 11 yr. old son, Charles. NATHANIEL BESLEY 1838: Died aged 6 weeks of South Combe, Templeton. SAMUEL BESLEY 1809: Died aged 19 yrs, of Templeton. SAMUEL BESLEY 1831: 1841 - 19 yrs, with own family in Chilcott household. SUSANNA BESLEY 1761: Husband James Quiche or Quicke of Burlescombe at time of marriage. Witness Henry Besley. SUSANNA BESLEY 1761: Husband William Maunder yeoman of Templeton at time of marriage. Spinster. By Lic. no recognised witnesses. Husband WILLIAM MAUNDER 1758: Son of William and Mary. Remarried after Susanna died to Mary NORTHCOTT 6 Jul 1815 Templeton. SUSAN BESLEY abt 1834: 1841 - 7 yrs, with own family in Chilcott household. THOMAZIN BESLEY 1759: Father of Tiverton at time of baptism. Married by licence, Spinster of Tiverton. Thomas a bachelor of Tiverton. 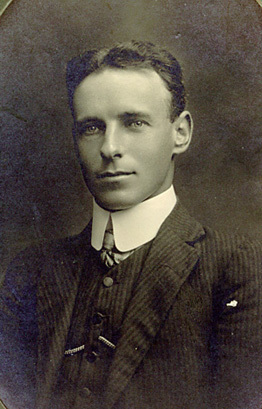 Witnesses William Maunder jnr. and John Besley. Everyone signed their names. WILLIAM BESLEY 1803: 1841 - 35 yrs, independent, dwelling Cowick St., St. Thomas the Apostle, Exeter, with wife and 3 children in same household as John and Harriett Chilcott and their five children. 1851 - 50 yrs, labourer dwelling 18 Radford Sq, Exeter, St Leonard with wife. Wife MARY abt 1796: 1841 - 45 yrs. 1851 - 40 yrs ?. (Down the road from Nathaniel at no. 17 is a 70 yr old widowed Mary Besley lodging). WILLIAM FREDERICK BESLEY 1900: 1901 - 9 mths, with parents. 1911 - 19 yrs, living with parents. Witheridge (South Molton) another child born to them that didn't survive. ALICE JANE 1879: Birth Reg. Mar Q 1879 Tiverton 5b 44. Died aged 3 yrs. Death Reg. Dec Q 1882 South Molton 5b 301. 1881 - Residing with family, Pillavin, Witheridge 2 yrs. ARTHUR EDWARD 1872: Birth Reg. Dec Q 1872 Tiverton 5b 435. 1881- 7 yrs, Residing with family, Pillavin, Witheridge. 1891 - 18 yrs, drapers assistant, dwelling 13-15 Stall St, Bath St James. 1901 - 28 yrs, Draper manager, dwelling Spring Villa, Malvern Rd with wife and baby son. Wife MARY ELLEN POPE abt 1872 Bristol: 1901 - 29 yrs. CHARLES HENRY B 1869: 1871 - 2 yrs Residing Broadmead farmhouse, Stoodleigh 1881 - Residing with family, Pillavin, Witheridge 12 yrs. "CHARLES HENRY BESLEY - Butcher, Baker, Farmer and stock dealer, St. Andrews. This business was established about the year 1872, and has been conducted by Mr. Besley since 1899. The building was erected on a freehold section in 1901 to replace the old premises, which were destroyed by fire. It is built of wood and iron and consists of a shop and 10 roomed residence, with a brick bakehouse behind. Mr. Besley was born in Devonshire, England in 1870, and worked on his father’s farm, until coming out to NZ by the SS Rimutaka in December 1889. For a time he was stationed in the Levels District, and after visiting the North Island, began farming at Beaconsfield in 1895. However, he sold his farm in 1899, and acquired his present business. Mr. Besley owns 70 acres of freehold on the beach, between the railway lines and the sea, and he has about 150 acres of leasehold in other parts of the district. As a freemason he is attached to St John E C and he is also a member of the local school committee. Mr. Besley is a stock dealer and exporter of frozen meat. He was married in 1895 to a daughter of Mr. Robert Grigg of Beaconsfield, and has two daughters." - From NZ Cyclopedia 1903 - Canterbury pg 1041. DOROTHY 1899: Dorothy admitted St. Andrews, Waimate 17 Oct 1904 by Chas. H. Besley. Timaru Main School records say Estelle's last day at school was 27th Mar. 1914 and her destination was Melbourne. Other two girls finished school on 18th Dec 1913. ELIZABETH 1876: Birth reg. Mar Q 1876 Tiverton 5b 454. 1881 Cencus: Residing with family, Pillavin, Witheridge 4 yrs . 1891 - 15 yrs, domestic assistant living at home. 1901 - 28 yrs, housekeeper living with parents. ELLEN BEATRICE 1881: 1891 - 9 yrs, scholar living at home. Birth Reg. Dec Q 1881 South Molton 5b 438. Helen on marriage reg. 1901 - 19 yrs, drapers assistant, dwelling 4 Castle St Cirencester in Mogg household. ETHEL 1883: Birth Reg. Mar Q 1883 South Molton 5b 472. 1891 - 8 yrs, scholar living at home. 1901 - 18 yrs, mothers help, living with parents. FLORENCE 1883: Birth Reg. Mar Q 1883 South Molton 5b 472. 1891 - 8 yrs, scholar living at home. 1901 - 18 yrs, drapers assistant, living with parents. 1911 - 29 yrs, with parents. FRANCIS (FRANK) EWART PAYNE 1869: 1871 Census: 1 yr Residing Broadmead farmhouse, Stoodleigh 1881 Cencus: Residing with family, Pillavin, Witheridge 12 yrs. 891 - 21 yrs, farmer's son dwelling at home with parents.19 Frank, farmer, Whenuakura, 1918, 1919, 1921, 1924. His father was Henry Besley who married Elizabeth Payne daughter of a Methodist Minister. Some info about Frank. He is reputed to have cleaned up the villages top scrapper in a fight, and was thus "King of the town" for a while at least. He emigrated to Australia where he ran a butchery with brothers Charles and Tom. He moved to NZ and there met and married Mary Jane (Buckingham). HENRY 1842: 1851 - 9 yrs, living with parents. 1861 - 19 yrs, farmers son, living with parents. 1871 - 29 yrs Residing Broadmead farmhouse, Stoodleigh, farmer 140 acres. 1881 - Residing Pillavin, Witheridge, 39 yrs Farmer of 344 acres 344 acres employing 2 men and a boy - 9 children. Cencus Place: Witheridge. 1891 - 49 yrs, Farmer, dwelling Pillivon Farm, Witheridge with wife and 8 kids. 1901 - 59 yrs, farmer, dwelling Pillivin Farm, Witheridge, South Molton, with wife and 4 grown up kids plus 2 servants. 1911 - 69 yrs, retired farmer, dwelling Cypress, (6 rooms), Witheridge with wife of 44 yrs, unmarried sister, daughter Florence and visitor (3 yr old Arthur Henry Knapman). They had 13 children in total - 2 died young. Born June Quarter, 1842, X 281. Marriage reg. Jun Q 1867 Tiverton 5b 767. Witheridge newspaper: August 3rd 1895: Rev J P Benson's rent audit was held at the Angel Hotel. Present were the Rev Benson, and Messrs Wreford, Vickery, Blackmore, Lee Maunder, Lewing, Matthews, Besley, etc. Mr Wreford in proposing the health or Mr Benson hinted that no land bill could benefit a set of tenants where such mutual understanding and kindly feeling existed as between them and their landlord. In response to the toast most heartily drunk, Mr Benson said it was his pleasure at all times to make his tenants comfortable and whenever he had any spare cash necessary repairs should be attended to. He also hoped the parishioners would assist him in church and school expenses. Henry Besley married Elizabeth Payne daughter of a Methodist Minister. Henry became a minister himself, and according to my info was away for long periods preaching, leaving his long suffering wife to cope with 13 children, who apparently got into a few scrapes often in public houses. Henry was born on 17th March 1842. Died aged 83 yrs. Probate: Besley - Henry of Witheridge, Devon, died 20 March 1925. Probate Exeter 12 September to Elizabeth Besley, widow. Effects £531 10s 3d. Wife ELIZABETH PAYNE: 1891 - 49 yrs. 1901 - 59 yrs. 1911 - 69 yrs. HENRY (HARRY) 1874: Birth reg. Jun Q 1874 Tiverton, 5b 446. 1881 - Harry, 6 yrs, with family. 1891 - 16 yrs, farmers son living at home with parents. 1901 - 25 yrs, farmers son, living and working for family. He is obviously the one who took over the running of the farm as his wife's probate gives this address. Probate: Besley - Bertha Ellen of Pillivin Farm, Witheridge, Devon, (wife of Henry Besley), died 23 January 1927. Probate London 1 March to the said Henry Besley, farmer, and Annie Gertrude Hayes (wife of Sidney Richard Hayes). Effects £905 6s 7d. LUCY "EDITH" 1871: Birth Reg. Jun Q 1871 Tiverton, 5b 449. 1881 Cencus: Residing with family, Pillavin, Witheridge 9 yrs. THERESA HELENA 1868: Birth reg. Sep Q 1867 Tiverton. 1871 - 3 yrs Residing Broadmead farmhouse, Stoodleigh. 1881 Cencus: Residing Pillavin, Witheridge, 13 yrs. 1891 - 23 yrs, Domestic assistant living at home. 1901 - 33 yrs, niece of Eleanor Besley at 37 Brook Street., Bampton. THOMAS EGBERT 1880: Birth Reg. Jun Q 1880 Tiverton 5b 478. 1881 - Residing with family, Pillavin, Witheridge 11 mths. 1891 - 10 yrs, scholar living at home. Thomas E., sheep buyer, Albury, 1921, 1924, 1926, 1928. Buried Albury Cemetery, South Canterbury aged 71 yrs. ADELINE CAMILLA BESLEY 1889: 1891 - 2 yrs, living with parents. 1901 - 12 yrs, living with widowed mother in Bampton. 1911 - 22 yrs, assistant draper, to Mr Frost, 30 High Street, Exeter. Died aged 90 yrs. BEATRICE OLIVE BESLEY 1906: 1911 - 4 yrs, with parents. CAROLINE FREDRICA BESLEY 1872: Died aged 4 yrs. CECELIA BESLEY 1840: 1841 - 1 yr, with family. Died aged 3 yrs, of South Combe. EDWARD BESLEY 1845: Died aged 8 days, of South Combe. Brook St. with husband and 2 sons - Gilbert Charles 5 yrs (b. 1Q 1896 - d. 2Q 1916 Winchester) and Frederick Allen 5 mths (b. 4Q 1900 - 1956 Ealing). 1911 - 40 yrs, dwelling 7 Brook St., Bampton with huband and youngest son. Married 18 yrs and lost 2 children by 1911. Husband WILLIAM CHARLES NOTT: 1901 - 29 yrs, plumber and ironmonger (employer). 1911 - 40 yrs plumber, painter and tinsmith working on own account. FRANCIS DEREK JAKEWAY 1915: Marriage notice - "JAKEWAY - WATSON, On Aug. 7 1941 at Littleham Church, Exmouth, Devon, Francis Derek Jakeway of Nigerian Administrative Service and of Exeter to Phyllis Lindsay Watson of Exmouth" D.T. 9/8/1941. GEORGE BESLEY 1795: 1841 - 45 yrs, farmer, dwelling South Coombe, Templeton with wife, 5 children and 5 servants. 1851 - 56 yrs, farmer of 366 acres, employing 12, dwelling Higher South Coombe, Templeton with wife, 7 children. 1861: 66 yrs, farmer of 350 acres employing 5 men and 3 boys, dwelling Higher South Coomb with wife and 4 offspring. George paid rent for Lower South Coombe Farm, taking on Landfoot (farm?) as well for a while in 1863, at least until 1864. 1871 - 76 yrs, Farmer, of 66 acres, dwelling Great Esworthy with wife, 2 adult daughters 2 American grandchildren and a farm servant. Died aged 80 yrs, of ? Asserhays Farm, Templeton. Probate: 7 June 1875. Effects under £300. The will of George Besley, late of Esworthy Farm in the Parish of Templeton in the County of Devon, yeoman, who died 29 Mar 1875 at Esworthy Farm, was proved at Exeter by Isabella Besley of Esworthy Farm, Widow, the relict and sole Executrix. Wife ISABELLA VENNER 1806: 1841 - 30 yrs. 1851 - 40 yrs. 1861 - 53 yrs. 1871 - 63 yrs. 1881 - 74 yrs, retired farmers wife, widow, visiting household of Jane Payne, Bridge Cottage, Templeton. HENRIETTA BESLEY 1836: 1841 - 4 yrs, with family. 1851 - 14 yrs, living with parents. 1861 - 24 yrs, farmers daughter, living with parents. 1871 - 34 yrs, wife of John Hepper, 35 yrs, farmer of 147 acres, dwelling Higher West Coombe with 3 children and Niece Emma B, b. US. ISABELLA BESLEY 1849: 1851 - 2 yrs, living with parents. 1861: 12 yrs visiting h.h. of Isaac Venner, (father of Charles B), Kerscott Farm, Witheridge, Bishops Nymton. 1871 - 22 yrs, with parents. 1891: Single, 41 yrs niece of Charles E Venner, single, farmer b. Stoodleigh, Slew Farm, South Molton, Bishops Nympton Parish. Her sister Louisa E the housekeeper there. JOHN FRANCIS BESLEY abt 1829: see below. LARA WILLIAM BESLEY 1882: 1891 - 8 yrs, scholar, living with parents. 1901 - 16 yrs, bakers assistant to Aunt and Uncle (Jane Ford Escott and Francis William Cottrell)Station Rd., Pinhoe. LAVINIA PULLEN BESLEY 1843: 1861 - 17 yrs, articled pupil, living at Dove Cottage, Culmstock. Can find no other trace of her. LEWIS JOHN TEMPLE BESLEY 1878: 1881 - 22 yrs, scholar, with parents. 1891 - 12 yrs, scholar, living with parents. 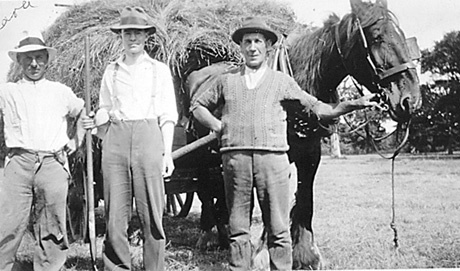 1901 - 22 yrs, Manager and worker on farm, living with widowed mother. A farmer, Druidshayne Farm at time of children's baptisms. 1911 - 32 yrs, farmer, Coombe Farm, Cove, Tiverton with wife and daughter in a 6 roomed dwelling (other daughter, Louisa Maud, with Baker grandparents at Shute Farm, Cove). Married 7 years at this stage and had 3 children (2 still living). Died Coombe Farm, Cove aged 77 yrs. Probate: Lewis John Temple Besley of Combe Farm, Cove, Tiverton, Devonshire, died 13 February 1956. Probate Exeter 13 December to Midland Bank Executor & Trustee Co. Ltd. Effects £5447 17s 2d. Wife MINNIE BAKER 1884: Born Shute Farm Cove. 1911 - 27 yrs. LOUISA AMELIA BESLEY 1834: Died aged 9 weeks. LOUISA ELLEN BESLEY 1846: 1851 - 5 yrs, living with parents. 1861 - 15 yrs, farmers daughter, living with parents. 1871 - 25 yrs, with parents. 1891: Single, 44 yrs niece and housekeeper of Charles E Venner, single, farmer b. Stoodleigh, Slew Farm, South Molton, Bishops Nympton Parish. Her sister Isabella also there. 1901 - 55 yrs, living on own means at 37 Brook St, Bampton with widowed sister-in-law, Eleanor Besley. 1911 - 65 yrs, single sister to Henry. living with him and his family at Cypress, Witheridge. Died aged 68 yrs of Witheridge. Probate: Louisa Ellen Besley of Witheridge, Devon, spinster, died 7 May 1914. Probate Exeter 13 June to Elizabeth Besley (wife of Henry Besley). Effects £455 14s 10d. LOUISA MAUD BESLEY abt 1904: 1911 - 7 years, with Baker grandparents at Shute Farm, Cove. LUCY EVELINE BESLEY 1870: 1881 - 11 yrs, scholar, with parents. 1891 - married with 2 little ones in Cardiff. Husband ROMEO RUSSELL: 1891 - 148 Cottrell Rd, Roath, Cardiff. MARY AURELIA BESLEY 1873: 1881 - 7 yrs, scholar, with parents. 1891 - 17 yrs, farmers daughter, living at home. 1901 - 25 yrs, housekeeper, living with widowed mother. 1911 - 37 yrs, single, assistant dairy worker, living with widowed mother at 37 Brook St., Bampton. OSWALD BESLEY 1890: 1891 - 5 mths, living with parents. 1901 - 10 yrs, living with widowed mother in Bampton. SAMUEL BESLEY abt 1834: 1841 - 8 yrs, with family. 1851 - 17 yrs, living with parents. 1861 - 28 yrs, farmers son, living with parents. 1869 Relieving Officer of the poor was his occupation at time of children's baptisms, until 1882 when it changes to farmer but address of Brook St doesn't alter. 1881 - 47 yrs, Relieving Officer Munic., dwelling Brook St with wife and 5 children plus sister-in-law, Bessie Escott and a 15 yr old servant. 1891 - 58 yrs, Farmer and Registrar, dwelling 37 Brook St Bampton, with wife and 5 offspring - servant Sarah Chiplin 15 yrs. 1893 Kelly's Trade Directory - Samuel Besley, Farmer,Registrar of births and marriages for Bampton sub-district and vaccination officer for Northern District of Tiverton. 37 Brook St., Bampton. Probate: Samuel Besley of Bampton, Devon, farmer, died 6 March 1901. Administration (with will) Exeter 21 June to Eleanor Besley, widow. Effects £892 5s 4d. Wife ELEANOR ESCOTT 1851: 1881 - 29 yrs. 1891 - 39 yrs. 1901 - 49 yrs, widowed farmer (employer), dwelling 37 Brook St Bampton, with 4 children, niece Theresa H Besley, 2 servants and sister-in-law Louisa E, 55 in residence. 1911 - 59 yrs, widow, farmer (employer), dwelling 37 Brook St., Bampton, with daughter, 2 farm workers and a relative (grandson) - 15 yr old Gilbert Charles Nott - a book-keeper at a lime quarry. 8 rooms. Had 10 kids of whom 7 still living in 1911. Died aged 68 yrs. Probate: Eleanor Besley of Bampton, Devon, widow, died 20 July 1921. Probate Exeter 11 August to Lewis John Temple Besley, farmer. Effects £1205. SAMUEL DIXON BESLEY 1869: 1881 - 12 yrs, scholar, with parents. Samuel and Barbara were married in the home of her father, Alexander, and mother, Catherine Keith, nee Farnley, at Buffon Street, Sydenham. Her father was a contractor. Death cert no. 2616. some sources list him as just Dixon. Born 1st Quarter, 1869 Tiverton 5b 481. Died aged 56 yrs. Wife BARBARA JANE DUNCAN: City of ChCh Electoral Roll - Sydenham ward: Barbara Besley, housewife, Buffon St. Samuel Dixon, baker, Goethe St. Died aged 73 yrs. Both buried Bromley Cem. THOMAS BESLEY 1832: 1841 - 10 yrs, with family. 1851 - 19 yrs, living with parents. 1861 - 29 yrs, railway officer, boarding 11 Orchard Place, Weston-super-Mare. 1871 - 29 yrs, railway book keeper, lodging 3 Orchard St, Weston-super-Mare. 1881 - 49 yrs, railway parcel clerk, living alone at 7 Orchard St, Weston super Mare. CLARA BESLEY abt 1860: 1860 US census - 4 mths, with parents. 1871 - 11 yrs, boarding with family of John Chown at Temple Hill Grocer's shop, Devon. 1881 - 21 yrs, housemaid to retired Irish Colonel Wm Blakeney, Bradley Down, Tiverton. EDWARD TORRENCE BESLEY 1897: 1901 - 3 yrs, with parents. 1911 - 13 yrs, living with parents. Private, Kings (Liverpool Regiment), 8th battalion. Killed in action. ELLEN BESLEY abt 1857: 1860 US census - 4 yrs, with parents. 1871 - 14 yrs, with grandparents back in Devon, England. EMMA B BESLEY abt 1859: 1860 US census - 2 yrs, with parents. 1871 - 12 yrs, with uncle (John Hepper) and aunt (Henrietta Besley) at Higher W Combe. 1901 - 42 yrs, dressmaker (working on own account), dwelling Exeter St., Crediton with widowed mother. FRANCES ISABELLA BESLEY abt 1856: 1860 US census - 5 yrs, with parents. 1881 - 26 yrs, domestic servant. GEORGE HENRY BESLEY abt 1863: 1871 - 8 yrs, with grandparents back in Devon, England. 1891 - ??? 1901 - 39 yrs, barman, dwelling DK View Rd., Barry, Glamorgan with wife and 2 sons. 1911 - 46 yrs, warehouseman in drapery, dwelling 98 Treharris St., Cardiff, (5 rooms) with wife of 21 yrs, and the 2 surviving children of the 4 born to them. Died aged 69 yrs. Wife ELIZABETH ANN PARDON abt 1865: 1891 - 28 yrs, married, living with parents George and Elizabeth Pardon in Chagford, occupation given as Domestic cook. 1901 - 38 yrs. 1911 - 46 yrs. Died aged 67 yrs. JOHN FRANCIS BESLEY 1829: 1841 - 11 yrs, with family. 1851 - 21 yrs, living with parents. 1860 US census - 29 yrs, Oakfield, Genesee, NY, with wife and 5 children, plus 20 yr old Laura Mrell. Died aged 36 yrs of South Combe. Wife ELIZABETH BURDEN abt 1825: 1860 - 36 yrs. 1871 - 48 yrs, cook at Female Reformatory, St Sidwell. Exeter. 1881 - 58 yrs, nurse visiting Susan Skinner, Townsend, Chittlehampton. 1901 - 78 yrs, widow, dwelling Exeter St., Crediton, Devon, with daughter Emma B. Died aged 80 yrs. JOHN FRANCIS BESLEY 1864: Son of yeman, Lower South Combe. Died aged 1. JOHN FRANCIS G BESLEY 1895: 1901 - 6 yrs, with parents. 1911 - 16 yrs, warehouseman in grocery, living with parents. Died aged 82 yrs. LAURA BESLEY abt 1860: 1860 US census - 4 mths, with parents. 1871 - 10 yrs, servant in household of Jacob Venner, Hill Farm, West Anstey. 1881 - 20 yrs, domestic servant inhousehold of Uncle Jacob Venner, Hill Farm, West Anstey. 1891 - 29 yrs, servant to Blackman family, 38 Lessar Avenue, Clapham. For other Besley (and derivitives) families elsewhere in Devon click on the links below. If you can add to these pages with data or photographs, wills, certificates etc please email me. Also if you would like contact with others researching in this area I am quite happy to add your wee speel and link contact directly to your email address. One Besly in 1543 at Calverleigh near Tiverton. Thomas Besley of Loxbear m. 22 May 1777 Rose Ash to Mary Bray - by Lic - witnesses John and Elizabeth Bray. by lic. Thomas Hopkins curate. Witnesses Mary Besley and John Turner - all signed. Henry Besley m. 1 Mar 1781 Rose Ash to Elizabeth Bray - by Lic - witnesses Thomas and George Besley. ALFRED JAMES TREVANION BESLEY 1887: 1891 - 3 mths, with parents. 1901 - 10 yrs, with parents. ARTHUR CARDEW BESLEY 1898: 1901 - 2 yrs, with parents. 1911 - 12 yrs, with parents. DOROTHY BESLEY 1887: 1891 - 4 yrs, with parents. 1901 - 14 yrs, with parents. 1911 - 24 yrs, dwelling with parents. EMMA AMELIA BESLEY 1853: 1861 - Tregent, 7 yrs, living with parents in Lapford Village. FANNY TREGENT BESLEY 1851: 1861 - Tregent, 9 yrs, living with parents in Lapford Village. JAMES BESLEY abt 1778: 1806 - James and Jane marred at St Thomas, Exeter - both of that parish. James signed his name and Jane made her mark. 1841 - James, 63 yrs, shoemaker, dwelling Coldridge Village with wife and 2 daughters. Wife JANE SOMERTON abt 1788: 1841 - 53 yrs. JAMES BESLEY abt 1819: 1861 - 42 yrs, harness maker, dwelling Lapford Village with wife and 4 kids. 1881 - 61 yrs, harness maker, dwelling Lapford Village with wife and son, John. 1891 - 72 yrs, retired sadler, dwelling West Side Lapford Village with wife and a servant. Wife FANNY ANN CARDEW abt 1815: 1881 - 66 yrs. 1891 - 78 yrs. Died aged 82 yrs. JOHN WILLIAM BESLEY 1854: 1861 - 6 yrs, living with parents in Lapford Village. 1871 - 17 yrs, Assistant schoolmaster at Village commercial Academy, in Lapford. 1881 - 26 yrs, Tutor of Classics and Languages, graduated London University, living with parents in Lapford Village. 1891 - 36 yrs, principal Private School, dwelling Moorside School, Okehampton with wife, three children, servants and pupils. 1901 - 46 yrs, Moorside Schhool, Okehampton, with wife and all 7 offspring. 1911 - 56 yrs,, private school master, headmaster, dwelling Moorside, Okehampton with 4 offspring. Information from the census says he was married for 25 yrs and had 7 children during that time - all of which were still alive. Wife JESSIE AMELIA CROFT abt 1862: 1891 - 29 yrs. 1901 - 39 yrs. 1911 - 49 yrs. LOVEDAY BESLEY abt 1822: 1841 - 20 yrs, with parents. 1851 - 29 yrs, Lovedale, servant to Esther Cooper, 3 York Place, Stoke Newington, MDX. 1861 - 39 yrs, unmarried Pauper living with brother Robert, also Mary Brookland, a 16 yr old servant - nurse. MARGARET AMY 1896: 1901 - 4 yrs, with parents. 1911 - 14 yrs, with parents. MARY abt 1832: 1841 - 9 yrs, living with parents. MARY ANN 1857: 1861 - 4 yrs, living with parents in Lapford Village. MARY TREGENT BESLEY 1887: 1891 - 2 yrs, with parents. 1901 - 12 yrs, with parents. 1911 - 22 yrs, with parents. ROBERT BESLEY 1826: 1841 - 15 yrs, male servant, dwelling Birch, Coldridge, in Densham household. 1861 - 34 yrs, Tailor, head of household, with sister, Loveday and a nurse in residence, dwelling Coldridge Village. 1841 - Clayhanger - Henry Besley 45 ag lab in household of Sarah Hill. 1841 - Clayhanger Village Ann 70 yrs, Elizabeth 65 yrs, both b. In. Dorothy Besley m. William Scott 10 Apr 1751. As we all probably know, the origin of our Besley family comes from France. Our ancestor was apparently one of two wealthy brothers who fled their shores and landed their ships in Barnstaple. This was due to a General Edict in 1536 urging the extermination of the Huguenots (Calvinist Protestants or Heretics - depending on which side you were on). This resulted in the killing of thousands. These two brothers established themselves in the area - one moving into Somerset while the other remained in Devon. Apparently there is documentation in the Town Council Archive Offices in Barnstaple that was viewed last in 1953 but has not been able to be located since. This information comes via an informant to Brian Besley. brick and tile maker yeoman Barnhay Cott.